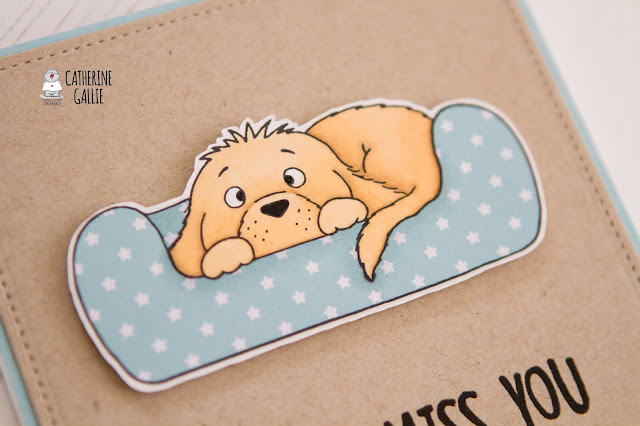 Today I'm sharing a card using the new 'I Just Miss You Puppy' stamp set. I love dogs so any stamp set with a puppy included is always a winner for me! To create this card, I cut a light blue piece of card into a square for my base. I then die-cut a stitched square using kraft cardstock. Using the sentiment included in the set, I stamped in black ink and then heat embossed with clear embossing powder over the top to add shine and dimension. Next, I adhered the kraft piece onto the blue piece and adhered them onto a square card base. I stamped and coloured the adorable puppy portion of the image using Copic markers. For his little bed, I used the paper piecing technique and added a little shading where the dog's shadow would be. The image was then attached to the card using foam tape and that completed the card. This was a nice simple card but I'm really pleased with how it turned out. I hope you like it! Thank you for stopping by today, have a great weekend!